Rising rents in the Bay Area have made the developers of Cathedral Gardens in Uptown Oakland grateful they were able to create the project. For Dianna Ingle, EAH Housing vice president of real estate management, being able to bring high-quality housing that’s affordable to a low-income community was deeply rewarding. 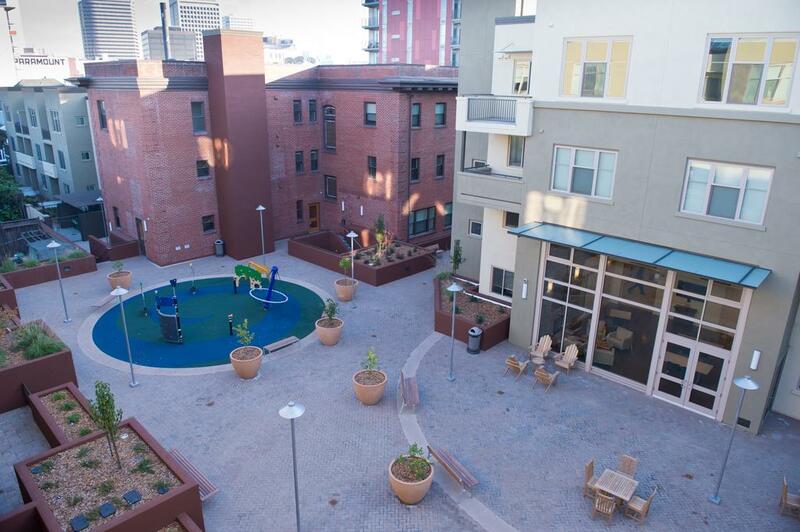 Located in the transit-oriented Uptown Oakland neighborhood, Cathedral Gardens adds 100 units to an area in dire need of affordable housing. One of its three buildings is a former rectory that was built in 1916 to house staff of the Saint Francis de Sales Cathedral that was built by the Roman Catholic Diocese of Oakland in 1893. The cathedral suffered extensive damage in the 1989 Loma Prieta earthquake and was demolished in 1993. But getting to that point was never an easy road, said Mary Murtagh, EAH housing president and CEO. EAH Housing had made offers to purchase the Cathedral site, but was unable to reach agreement on a price during the peak of the real estate boom. Construction began in June 2012 and ended in November 2014. “Completion of the property occurred just in time to serve the sky rocketing need for housing in Oakland as local rents began to surge in the tech boom,” Murtagh said. In addition to creating housing opportunities for low- and extremely-low income families, construction of Cathedral Gardens has helped with the physical cleanup of the Uptown area, developing several neighborhood partnerships, installing new landscaping to increase usability and safety of the local park, an influx of more than $30 million into the local economy for construction and staff jobs, and an increased effort in sustainability for high-density affordable housing. On the property, residents have access to a variety of community facilities including a community room, afterschool homework center/technology lounge, workout room and laundry facilities. During the Cathedral Gardens application period, 5,000 applications were submitted.